If you’re looking for a dish to warm you up this is a good one with it’s warming spices. You can cut down the preparation time by cooking the butternut squash the day before. I have also seen butternut squash already diced and ready to be cooked in the grocery if you want to cut down on preparation time. This dish can be eaten as a whole meal or as a side dish. It is adapted from the Kitchn’s recipe. You can certainly use the cous cous or any other type of grain. 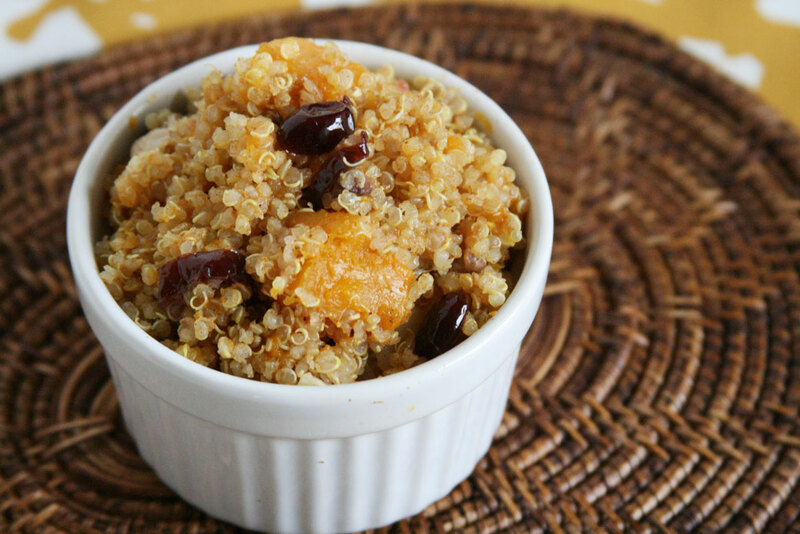 I love quinoa because it’s so good for you (protein, iron, vitamins, anti-inflammatory) and it’s a versatile grain. If you have a very sharp peeler/knife, first skin the squash. Cut it into quarters diameter wise. Then dice it into 1″ pieces. (save the seeds to bake afterwards!) Toss with 2 TBS cooking oil into a baking dish. Dice your onion into large chunks and add to the dish as well. Roast at 425 degrees for 30 minutes or so until it’s soft. If you don’t have a sharp peeler/knife, place the whole butternut squash in a pan with 1/2″ of water in the bottom. Allow it to cook for about 30 minutes. If it’s soft enough, then skin it and dice it, and continue to cook until soft. Don’t allow it to get too soft or else it will be too mushy to dice. Add hot water to the cranberries and allow to plump while cooking quinoa. Rinse quinoa and add with the 2 C of vegetable broth into a stockpot. Bring to a boil, cover, reduce to a low simmer and cook for 15 minutes. Remove cover. Add the dressing, the butternut squash, and onions, to the quinoa. I’ve only just discovered quinoa, and have been looking for some recipes so thank you for sharing. It looks and sounds delicious! Great looking recipe! I don’t think I’ve tried quinoa, but you’ve inspired me to do so! Great! It is much like cooking rice, but more forgiving. It’s best to simmer it as low as possible for the longest amount of time. People always say to rinse it, but you need a fine mesh strainer. I’ve forgoed the rinsing before, and I haven’t noticed a difference. Thanks for the advice! Can’t wait to try it! I used quinoa in a recipe last night, I put it in vegetable soup and everything just to add volume and quality.